I don’t think there’s anything good about Discovery’s take on Klingons. They have no sense of humor, monologue interminably, are tiresomely self-righteous, and they look awful. I don’t know if I realized it before “Through the Valley of Shadow,” but the Klingon make-up redesign is just absolutely abysmal. It’s rubbery and bland and only barely resembles the Next Generation and Deep Space Nine designs. That might be more subjective than most of my pronouncements, but I hope we can all agree at least that the Klingons on this show are a drag. In “Shadow,” a new signal (remember those? Still don’t know what’s causing them) appears over the Klingon planet Boreth, the home of a monastery devoted to Kahless and more or less the spiritual heart of the Klingon empire. This isn’t a place that welcomes outsiders, which gives Tyler an excuse to call up his ex and ask for help; which in turn gives the show an excuse to revisit what might be its most excruciating subplot—the warrior woman and the baby that Ash left behind. "Through The Valley Of Shadow"
Is anyone invested in this? It feels like a distraction even for people who care about Ash and Michael hooking up. L’Rell is boring (theoretically fascinating, in practice just dull as hell), and while I suppose there’s reflexive pathos in any parent being forced to give up their child, the whole situation is rote and references a part of Tyler’s character that still doesn’t make sense to me. I have no idea what losing the Voq part of his personality did to him, or what was there before, or who he is now. He just sort of drifts from place to place, and we know we’re supposed to care about him because other characters seem to, but there just doesn’t seem to be that much there. That he even decided to go with the Klingons after season one is bizzaire—and the fact that the show moved away from that in season 2 makes it even stranger. But really, Ash isn’t the problem this episode (which I actually largely enjoyed); it’s just everything falls apart when we’re supposed to be caught up in the tragedy of L’Rell and Tyler giving up their child, and that child ending up at the Boreth temple and being a full grown adult because Time Crystals are Magic or something. It’s a non-starter for a storyline, something which seems like it should matter because it has connections to earlier events, but has such little emotional resonance or meaning that it just sits there, empty and clever and not much else. The majority of the episode, though, is dedicated to Pike’s attempts to retrieve the Time Crystal from the monastery, and Michael and Spock’s efforts to track down a missing Section 31 ship. (There’s also a bit of character stuff with Stamets, Culber, and Jet Reno that I’m somewhat ambivalent on.) 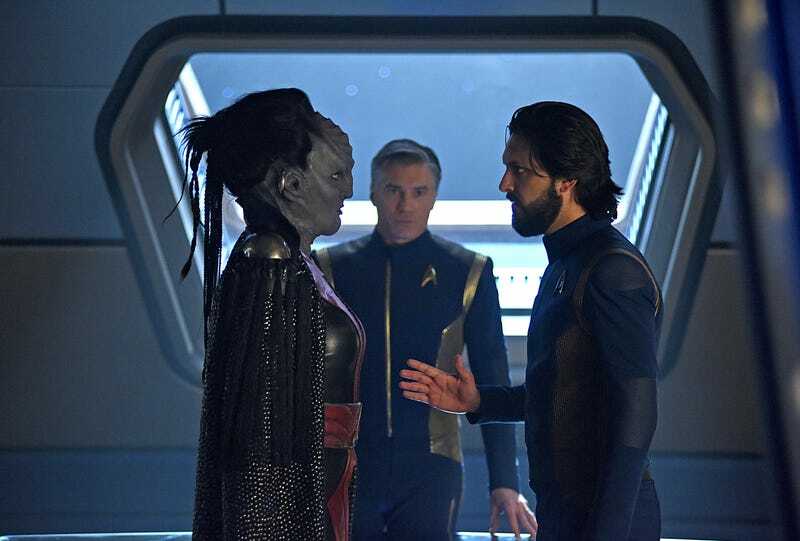 Pike’s storyline attempts to exploit our foreknowledge of his ultimate fate for some tough choices drama, and Michael’s fight with Control once again makes her the center of the action. Both arcs work to varying degrees of effectiveness; Pike’s because it really leans into the horror of his situation (despite it not making a ton of sense), and Michael’s because it’s a fun, tightly constructed bit of suspense with some excellent effects work and a predictable-but-creepy twist. 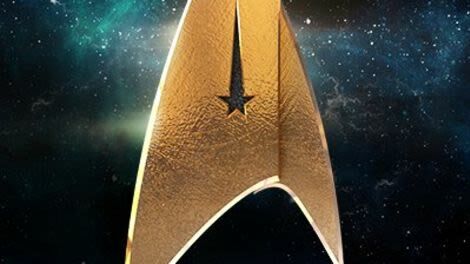 About the Pike stuff: putting aside the hilariousness of a show having to take a fifty year-old plot twist driven by economic concerns (the people running Star Trek didn’t work “The Cage” into continuity because they were deeply invested in its lore implications) as deadly serious, the captain having to see his horrible fate and then willingly accept it in order to save the universe is such a dramatically powerful idea that it plays all right, despite not making a damn bit of sense. Well, maybe that’s the wrong way to put it. Maybe there will be an explanation later on as to why the picking up the crystal locked Pike into this specific future, and the mysticism around the time crystal is just a variant on the sort of thing DS9 did with Bajor and the wormhole aliens. It’s not contradictory so much as a lot taken on faith at once. It works because Anson Mount (who is the stealth MVP this season) really sells the fear and uncertainty, and because the effects really lean into the body horror of Pike’s now-inevitable injuries. Michael and Spock’s storyline is more fun, to the point where I wish the episode spent more time on building it up. The set-up is excellently creepy: they go to check on a Section 31 ship that’s gone off the grid, and find that the entire crew has been jettisoned to die in space. They find a single survivor, who Michael recognizes from her time on the Shenzhou. Normally I’d make a joke about how little that matters to the audience, but I’m not sure it’s supposed to; the former Shenzhou crewmember is an attempt by Control to get past Michael’s defenses so it can assume control of her body in order to get easy access to the Sphere data. Control fails, but just barely, and the climax, which has Michael shooting desperately at a cloud of nanomachines as Spock works in the corner to thwart them, is excellent. On the whole, this is one of those piece-moving episodes critics like myself are always talking about. After last week’s emotional highs, we’re back to business as usual, or as much as business can ever be “usual” on Discovery. As the season heads into the home stretch, it’s maintaining momentum very well, and whatever nitpicks (or problems with the storytelling philosophy that seems to drive the series as a whole) I have, I’m excited to see where this ends up. Oh right, the return of Jet and the romantic problems of Stamets and Culber. I had high hopes for both of these, but Jet has been such a general non-presence this season that her appearances are more a distraction than a pleasant surprise. Stamets and Culber are more frustrating, because every step forward along the road to their all but certain reconciliation is making it more and more obvious how little we know about either of them. Stamets is a control freak and kind of annoying, Culber is… not that. Dying and coming back to life are the most interesting things about him, and after feinting towards making that more of a concern, he’s now more or less back where he was at the start. It’s honestly as frustrating as the Michael/Ash relationship, and while having a prominent gay relationship between two regular characters on the series is good as far as representation goes, it doesn’t excuse shallow (or non-existent) writing. We’re nearing the end of the second season and there still hasn’t been much effort to develop much of the supporting cast.